Deep learning has become a new trend of image recognition tasks in the field of medicine. We developed an automated gastritis detection system using double-contrast upper gastrointestinal barium X-ray radiography. A total of 6520 gastric X-ray images obtained from 815 subjects were analyzed. We designed a deep convolutional neural network (DCNN)-based gastritis detection scheme and evaluated the effectiveness of our method. The detection performance of our method was compared with that of ABC (D) stratification. Sensitivity, specificity, and harmonic mean of sensitivity and specificity of our method were 0.962, 0.983, and 0.972, respectively, and those of ABC (D) stratification were 0.925, 0.998, and 0.960, respectively. Although there were 18 false negative cases in ABC (D) stratification, 14 of those 18 cases were correctly classified into the positive group by our method. 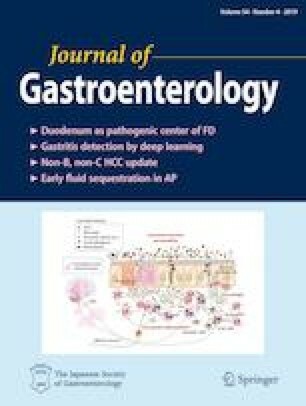 Deep learning techniques may be effective for evaluation of gastritis/non-gastritis. Collaborative use of DCNN-based gastritis detection systems and ABC (D) stratification will provide more reliable gastric cancer risk information. The clinical data were acquired at The University of Tokyo Hospital in Japan. This study was partly supported by Global Station for Big Data and Cybersecurity, a project of Global Institution for Collaborative Research and Education at Hokkaido University JSPS KAKENHI Grant number JP17H01744.